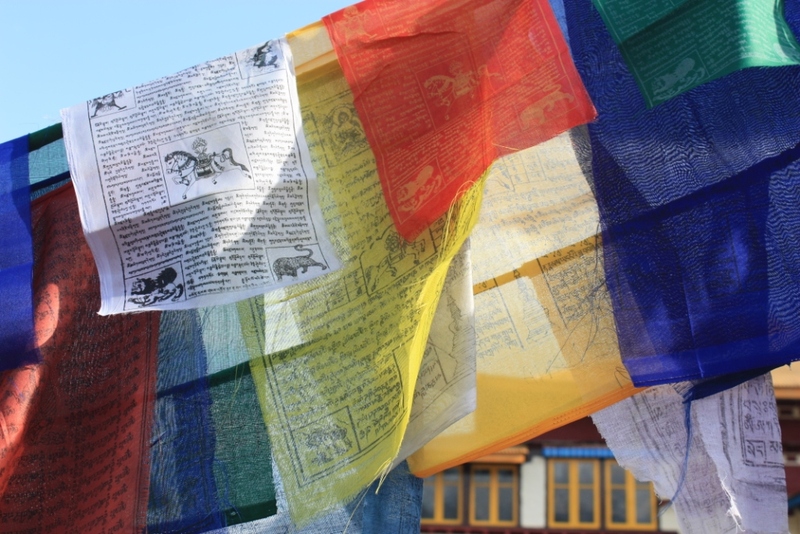 Now heavily associated with Tibetan Buddhism, colorful prayer flags are believed to have originated with Bon–an indigenous religion of Tibet that predated Buddhism’s arrival. Traditionally, the color progression from left to right is blue, white, red, green, and yellow (i.e. as seen in the top row), but variations can be seen. Besides monasteries and temples, one will often see strings of flags out in natural settings on mountains. The day and time of placement of the flags is considered carefully because it’s believed that if they are hung at inauspicious times they may bring bad fortune instead of the desired compassion and peace. This entry was posted in Buddhism, India, photographs, Photos, pictures, Tibet, Tourism, travel and tagged Bon, Buddhism, Gadhan Thekchoking Gompa, Himachal Pradesh, India, Manali, photographs, photos, pictures, Prayer Flags, Tibet, Tibetan Buddhism, tourism, travel, Vajrayana by B Gourley. Bookmark the permalink.